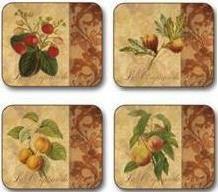 A warm fruit design featuring images of apricot, strawberries, peach and figs on the placemats with additional two images of cherries and apples for the coasters. The background for the fruit image is a lace texture in warm orangey-peach, the right hand side of each placemat and coaster is an appliqué style design of oak leaves and acorns in terracotta tone-on-tone. The La Confiture Design is a multi-image set. Set of four features assorted fruit images.